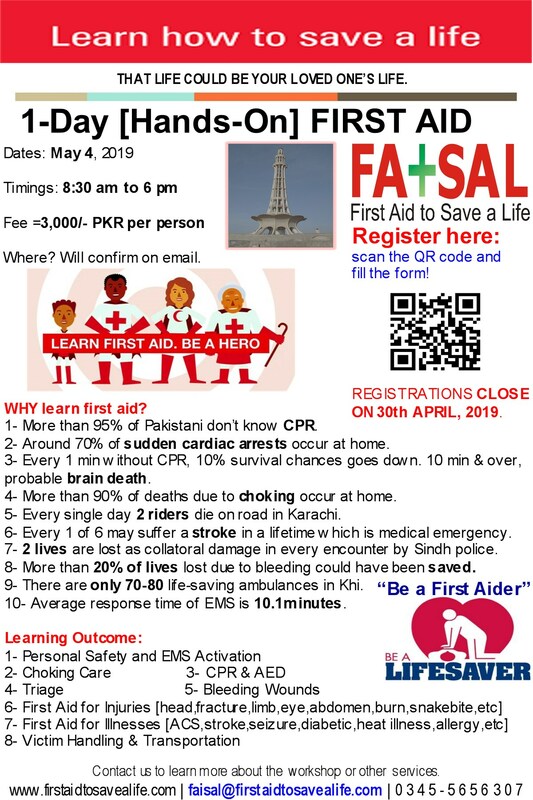 First Aid to Save a Life (FATSAL) Pakistan is very pleased to announce today a very special one and evenly surprising training option which on whole is to facilitate families interested in arranging (learning) first aid trainings for their young children, for themselves to take best care of their children and an aged family members. Why this First Aid for Family Training? Not 100% in Pakistan but at work we have first aiders and first aid kits BUT at home, in the car, on holidays and day out it is only you who is responsible to take care of your family members. Out this training program, for parents and family members, is essential to help you in unexpected/unplanned emergencies. Kids are our most precious treasures. What hurts them, hurts US. Our modest investment in training will give us confidence, learning and skills to use in an emergency. This course is for families to learn first aid all together. There will be no barrier, fun oriented but motivated learning/conducive environment will help each family member, ranging from young children to grandparents, learn basics of first aid. Furthermore, It is for anyone who looks after infants, babies, young children & senior family members. It also covers general first aid, and CPR on adults. It provides your family with the skills to help each other in an emergency or when general accidents happen around the house. Are Female Trainers Available for Family First Aid Programs? Yes, we will start this service from March 01, 2012 where female trainers will lead complete training programs for families where only female participants and young kids are participating in a course. Furthermore, assistant female instructors facility will be initiated from February 01, 2012 where they will involve in practicals and skill assessment process with female course participants. Kindly contact training center director if your require more details. This entry was posted in Basic First Aid, CPR and AED, First Aid and CPR, First Aid CPR and AED, First aid for Families, First Aid Training Programs, Pediatric First Aid Programs and tagged accredited training program, aed training programs, aed trainings in pakistan, are you willing to save a life, basic life saving skills, blended cpr training programs, blended training programs, chain of survival, closed chest compressions, compressions only, conventional CPR training vs online CPR class, CPR, cpr and aed, CPR and AED for Adults, cpr training classess in Pakistan, cpr trainings, CPR trainings in Islamabad, CPR trainings in Karachi, cpr trainings in lahore, CPR trainings in Pakistan, CPR trainings in Peshawar, female cpr trainers in hyderabad, female cpr trainers in islamabad, female cpr trainers in karachi, female cpr trainers in lahore, female cpr trainers in multan, female cpr trainers in pakistan, female cpr trainers in peshawar, female first aid trainers in hyderabad, female first aid trainers in islamabad, female first aid trainers in karachi, female first aid trainers in lahore, female first aid trainers in multan, female first aid trainers in pakistan, female first aid trainers in peshawar, female trainer for female course participants, First aid tips for infants and childs, first aid to save a life, first aid to save a life pakistan, first aid training, first aid training programs for families, first aid training providers, First Aid Trainings for Families, first aid trainings in lahore, Hands-Only CPR, Have you done your CPR training?, history of cpr, how to prevent cardiovascular diseases, hse training companies in islamabad, hse training companies in karachi, hse training companies in lahore, hse training companies in multan, hse training companies in pakistan, hse training companies in peshawar, in-house first aid training programs for families, inhouse first aid training courses for families, inhouse first aid training courses for females, Introducing First Aid Trainings for Families, life saving skills, online CPR training, online cpr trainings, Pediatric Training Programs, Pediatric Training Programs for families, Pediatric Training Programs for fathers, Pediatric Training Programs for mothers, personal safety the top most priority in emergency first aid, sudden cardiac arrest, sudden cardiac arrest and cpr, sudden cardiac arrest and use to aed, what should an infant's mother know about choking, what should an infant's mother know about first aid. Bookmark the permalink.